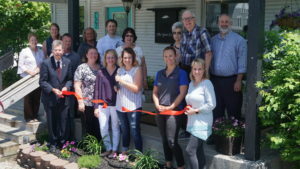 The Wells County Chamber of Commerce staff and Ambassadors welcomed Brandi Holmes’ new business Ellie Grace & Co. located at 727 N Main Street, Bluffton with a Ribbon Cutting on May 24. “Just like any girl, I have a love for clothing and an obsession with shoes and purses,” explained Holmes about her passion for starting a new business. Holmes was inspired by a Boutique she saw in Ohio years ago and decided to start a hobby out of her closet selling clothes online. Holmes operated the online business for two years and decided to take it to a physical location. “This is all so exciting and surreal having this dream come to reality,” stated Holmes. There is a meaning to the store name of Ellie Grace & Co. Ellie represents the Light of God; Grace is everything God has for us; and Company represents family and friends. “I was struggling to find a name and then one morning, the name and meaning was so clear to me and I knew I had to move forward with this dream,” said Holmes. Product within Ellie Grace & Co. are unique, and quantity is limited. “I may restock popular items one additional time, but not after that and new items arrive each week,” said Holmes. Holmes wants the community to know that the last Saturday of every month 10% of sales will be donated to a designated charity. Store hours are Thursday through Friday 10am to 6pm and Saturday from 10-3pm. Hattie Wondercheck, Ellie Grace & Co.
Kay Hunnicut, Ellie Grace & Co.
Brandi Holmes, Ellie Grace & Co.
Dede Rickard, Ellie Grace & Co.
Carl Rickard, Ellie Grace & Co.